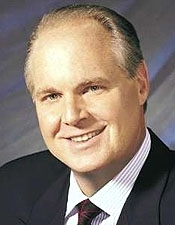 JANUARY 23--Plea negotiations between Rush Limbaugh and Florida prosecutors stalled last month when government officials insisted that the radio host cop to a felony, rejecting a defense suggestion that Limbaugh simply enter a pretrial diversion program and "continue to receive treatment for his addiction." In an exchange of letters (copies of which you'll find here), Roy Black, Limbaugh's attorney, and prosecutor James Martz offered starkly different versions of the punishment Limbaugh, 53, should receive were he to admit that he engaged in "doctor shopping" to score prescription painkillers and other drugs. In his December 15 letter, Martz argued that Palm Beach investigators had evidence to support "in excess of ten felony counts" against Limbaugh. Copies of the Black-Martz correspondence were released to reporters pursuant to a freedom of information request.